The Haywards take the reader on a journey through ordinary experience into the sacred world, uncovering obstacles to living in sacredness and exploring ways to work with these obstacles. Their meditations, personal insights, anecdotes, and Mindfulness exercises guide the reader toward self-knowledge and empathy... A helpful addition to collections on Western and Eastern approaches to living." -Library Journal "Being a warrior has nothing to do with waging war. Being a warrior means you have the courage to know who you are. Warriors never give up on anyone, including themselves. "-from Sacred World The Haywards lead retreats on the Shambhala teachings of Chogyam Trungpa, one of the pioneers of Buddhism in the West. 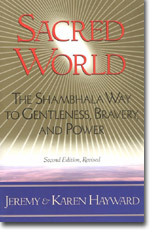 This book is the second edition of Jeremy Hayward's Sacred World: A Guide to Shambhala Warriorship in Daily Life (Bantam, 1995), herein completely revised. One of the book's purposes is to show the reader how to recover perception of the heart. The Haywards take the reader on a journey through ordinary experience into the sacred world, uncovering obstacles to living in sacredness and exploring ways to work with these obstacles. Their meditations, personal insights, anecdotes, and Mindfulness exercises guide the reader toward self-knowledge and empathy. The Haywards were friends and students of Trungpa, who died in 1987. A helpful addition to collections on Western and Eastern approaches to living. About the Author Jeremy and Karen Hayward were close friends and students of Chögyam Trungpa, one of the first Tibetan Buddhist teachers in America and founder of the Naropa Institute. Jeremy Hayward helped Trungpa present the teachings of Shambhala warriorship through Shambhala Training, of which he is now international education director. He is author of Letters to Vanessa: On Love, Science, and Awareness in an Enchanted World, and Shifting Worlds, Changing Minds: Where the Sciences and Buddhism Meet. Karen Hayward was the first director of the Kalapa Ikebana school of flower arranging that was founded by Chögyam Trungpa. The Haywards teach warriorship retreats around the world.